As those who follow my blog know, besides writing, my other passion is soccer. Nope, don't play it (other than to keep my 12-yr-old son in shape by smashing him now and again when he's juggling the ball in the house), but, as my dear husband will tell you, I can be a handful from the sidelines. Ask him if he still has any hearing in his left ear after last night's Timbers:Galaxy match--in particular, after the first goal of the evening in minute 26 by newbie Mike Chabala. Background. I live in Portland. Ergo, I'm a Timbers fan. Last year, in prelude to PDX going MLS, I wrote this article for a local magazine. The piece focused on the anticipated fervor once Portland joined the Major League, and was built around a popular player, Scot Thompson, who the Timbers Army dubbed "The Man with the Golden Heart." Now, a year later, those scrubby kits of the pre-MLS days are slick Alaska Air-sponsored jerseys. Our coach is a colorful dude with a Scottish accent (have you seen his hilarious Alaska Air commercial? ), and Scot with "one T" Thompson is no longer on the pitch. So, who will take his place in the hearts of the Timbers fans? Well, it was supposed to be Kenny Cooper. The 6-foot-3, 210-pound forward, who was aggressively plucked from the hopes of FC Dallas, made an early splash here in the Rose City. And then ... nothing. Cooper is big. He's driven. He tries hard. Maybe too hard. I'm going to go out on a limb here and say something I might regret, but from what I've observed, Cooper is a beat too slow, and he lacks that weird nebulous quality, the instinct--the intuition, maybe--for making the killer play. So strip him of the Captain's badge and slap it on Jack Jewsbury. Jack is a playmaker with an amazing foot. He's speedy, has crazy good sense of where his teammates are, and buries his PK's in the back of the net. "Cap'n Jack" is good, smart, plays well with others. So, is the the next Brandon Royesque Rose City icon? I don't think he is, and here's why. Though he's plenty talented and solid, and he has the chops to make All-Star from the roster of a nearly-last-place expansion team, I'm not quite sure he's rowdy enough. Yeah, you heard me. We're talking soccer, guys. The devil's sport. The game that used to be played with human skulls. Smoke bombs and fist fights and chanting. Sure, we play a somewhat squeaky clean game here in the Rose City. We don't brawl and ruckus and stab people in bars after our matches. But, I like to think that we've branded a particular fanbase. The same way Seattle invented grunge back in the dark ages, Portland has its own style. We are hard-core diy, we dress up small dogs in outfits and formalize citywide playdates for them, we've been known to stride naked down the street to make a point, and we have the biggest and best MLS fanbase in the country: the Timbers Army. And, two weeks ago, I think we finally got ourselves the right posterchild for our team. Mike Chabala. Last night's amazing win aside, the second Chabala touched down in PDX, he started stirring up excitement on social media (hosting a Galaxy match ticket giveaway on Twitter for the best 'beat LA' rhyme), and giving the Timbers the best gift ever: a left-footed back with spirit, intuition, and attitude. Oh yeah, and the ability to find the back of the net! Plus: he has the look. Five-o'clock shadow, lumberjacky, kinda just rolled out of bed, sparkle in his eye. 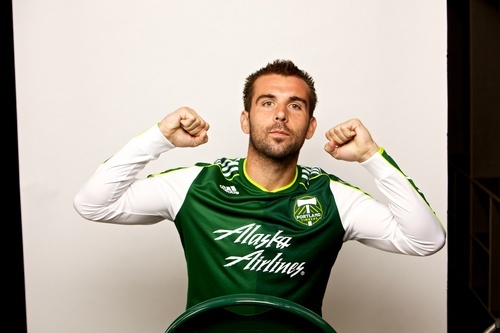 All in all, Chabala is the best thing for the Timbers since sliced logs. I'm looking forward to seeing more of his prowess at Jeld Wen, and possibly his Timbers' axe-wielding self on one of those ginormous billboards. I thought the Timbers played baseball. Thanks for setting me straight! Oh Max. You're so damn cute.